International Women's Day videos form a big part of celebrations on March 8, as well as providing a call-to-action for gender parity. Here are some of the most powerful, popular, interesting, effective and fun IWD videos from around the world over the years - and there are many more. Submit your video for potential inclusion on the International Women's Day website and social media channels. 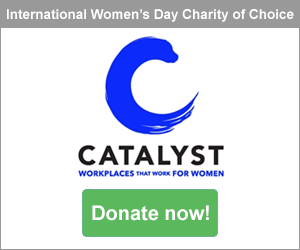 Remember, the IWD 2019 Best Practice Competition has a Best Video category. IWD videos are watched all over world - in schools, foyers, shopping centers, libraries, gymnasiums, hotels and at all sorts of events. The world is inspired by these fabulous dancers from India and they have a message for you! For kids, gender makes no difference - see why! This video has been an all-time favourite, and provides some 'must-see' inspiration for young girls. This brilliant #BalanceforBetter Rap song sends a fabulous message about creating a better business - and a better world. We've enjoyed this video since 2011 with its incredible facts and statistics about changes and developments impacting women in the workforce. Get your purple gear on everyone and let's celebrate International Women's Day. How did you press for progress on International Women’s Day? There are many issues facing women and girls around the world as they fight for equality and respect. British comedians Flo and Joan celebrate International Women's Day in their own special way, as only they would. Beyonce the American singer, songwriter, dancer and actress shared her female empowerment message with the world - and her fans shared theirs. Over the years, various groups have called on their communities to spread the word and celebrate International Women's Day in all its many forms. 12. What happens when you ask girls one important question? Being judged, labelled, deiscriminated against - girls around the world know how it feels. There are many, many more videos to watch. Enjoy!